Is Running on a Treamill Harder Than Outside? Logic says that hopping on a treadmill is easier than running outside- no wind, the belt is moving, and so on. The other day I hopped on for a short workout and was suffering at 8 mph, 1% grade. On the other hand, I had no trouble averaging that pace on a tight 10 lap track despite jogging the turns. Others have reported the same opinion that treadmill running feels more difficult. letsrun.com. Running on a treadmill is easier since you don't have the wind resistance when you are running on road. Your muscles have to adjust though to the differences of the treadmill vs road running. A person running road for years and then jumping on a treadmill and finding it harder is a no brainer. The opposite could be said also. A person running only on a treadmill and then jumping on the road would find that harder. Great discussion on the physics behind the question on the letsrun.com message board. Sun Dec 19: 2 miles with Sumo, then 9 miles. Felt good. Thurs Dec 23: am: 1 mile with Sumo, then 15 miles in 2 hrs. Felt good until the last mile. Sat Dec 25: am: 1 mile warm up, then 5K in 19:16 (6:15 pace), 1 mile cool-down. I felt ok but with a minus 2 F windchill and no sub 7 min miles in about a month what can I expect? 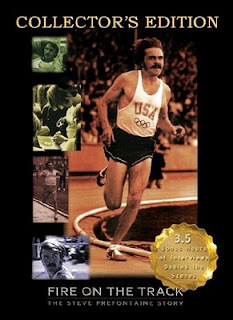 According to a poll by top running website letsrun.com , Fire on the Track: The Steve Prefontaine Story comes in at #1. Only 58 minutes long, so I am curious about the 3.5 hours of bonus interviews included with this Collectors Edition. Improve Your Marathon Without Extra Training! MY COMMENT: OK you have me convinced. I don't have access to Somax but I can stretch! Those who finished under three hours averaged a 3.1% body weight loss. Those who finished between three and four hours lost 2.5%. MY COMMENT: Ok, this is exactly the opposite of you would expect, but Tim Noakes, an expert on hydration and heat related problems, has been on the trail of optimal hydration during marathon and ultra events for several years and knows his data. Noakes is clear on this: "Drinking either more or less than to thirst impairs exercise performance". Marathon Training- Don't Try This! On a typical school day, Westover is awake by 4:45 a.m. and setting her treadmill to 9 miles per hour (a 6:40 per-mile clip); she does 15 to 20 miles at that pace before work. She's showered and out the door by 7:10 to start the 20-minute commute to the public school in Charlestown, N.H., where she teaches from 8 a.m. until 2:45 p.m. After the school day -- and any requisite faculty meetings -- she heads to Fall Mountain Regional High School at around 4:40 in the afternoon to do a 10- to 15-mile run at 6:30-6:45 pace with her coach, Larry Sayers. MY COMMENT: Are you kidding? Westover has run a 2:35 and 1:11 for the half, but 200 miles a week, much of it run at a quick tempo pace and half of her workouts on a treadmill? There are not many American runners, male or female, that could handle this workload. I'll be tracking her results in the future. Good luck Heidi! Unlike some other elite running programs, the Brooks Hansons Distance Project has no qualms about sharing their training secrets. In the January, 2011 issue of Runners World, Adam Buckley Cohen shares his Chicago Marathon experience after following the Hansens training program (New Year New You: Way of the Renegades ) that included no long runs beyond 16 miles! According to Kevin Hansen, "..it’s not like running the first 16 miles of a marathon, it’s more like the last,". The Hansens (Kevin and brother Keith) designate 3 key workouts a week- the long run, the marathon tempo, and the speed/strength workout. In preparing for the last several marathons I've done, I've made it a point to rest the day prior and after the hard long run. Hansens, on the other hand, insert an off day prior to a mid week marathon tempo run up to 10 miles, but sandwich the longest runs between workouts up to 8 miles. Tough! Boys’ skill windows reside between the ages of 9 and 12 and for girls between 8 and 11. Interesting concept- I wonder if somebody is working on glove/sleeve technology designed to keep your hands and forearms cool! The last few hot weather races in Korea I wore the loose Sleeveless Under Armour T-shirt and experienced no problems (I don't like the feel of their tight version). Today for some reason I went with the sleeveless Nike Dri-fit. Big mistake. Looking at the 2 shirts now, I realize the Underarmour is thinner and much lighter, crucial when running in warm, humid temperatures. This morning once my Dri Fit got wet, it felt uncomfortably heavy and never lived up to it's name. Hoping to stay cool and feeling strong, I went out at around 6:15 per mile, but I could tell early that this was going to be a tough day. I began pouring water over my head at every water station, but all that seemed to do was weigh down my shirt, and I noticed the skin on my face and arms was soon bone dry- and that's a problem. Was pouring water somehow inhibiting my sweat response (to be honest, I am going to have to do some reaearch on that one)? 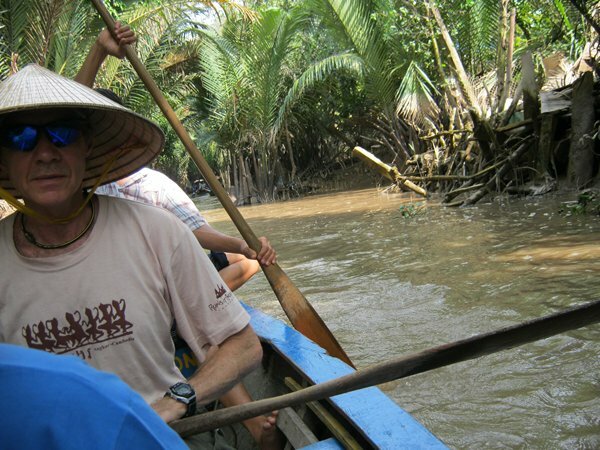 A more likely explanation was my failure to acclimatize sufficiently. Thinking I might begin to sweat, I abandoned that strategy and slowed the pace to avoid a major blow-up. While I did take water early on, after half I didn't drink much since my gut felt full. I began feeling better and while I wasn't going to get back down to 6:15s, I did hold a steady pace sub 7 to finish in 1:26 something, or a 6:30 per mile ave according to my GPS-and my Dri-fit was still soaking wet (I am not positive but pretty sure I finished 18th or 19th). This one could have ended up much, much worse. Right now, about 11 hours after we started, the temperature in Siem Reap sits at 29 C or 84 F with 66% humidity and the sun is down. I wasn't ready for these conditions. Got into Cambodia around 11 pm- 1 am Korea time I so was beat. I did 6 x 800 yesterday around 3 min (under with the tailwind, over against the wind), so the combination of that plus 8 hours of sitting (bus and plane), my legs felt pretty rough this morning. Obviously it's hot, but I got out around 7 am for 5 miles and it didn't feel too bad. The 0630 race starting time, plus, at least according to one source, water every 2.5 kilometers on the course should be enough to keep dehydration at bay. This race is bigger than I thought- more than 4,000 in all the races. 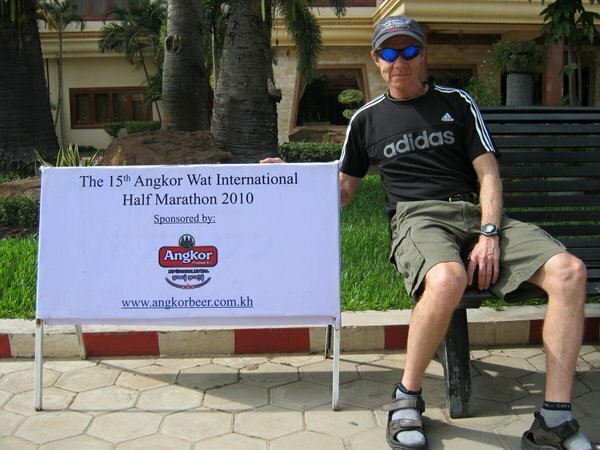 Angkor Wat Half Marthon They also offer a 100K bike tour on Sat! 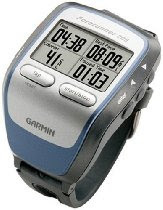 I love my Garmin Forerunner 205- use it to track distance and speed or find yourself out of a confusing trail. 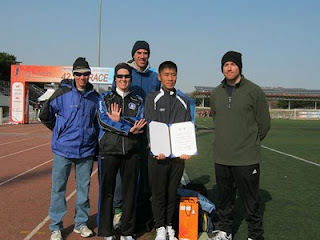 Sun: race in Seoul- I ran the first leg on a marathon relay, which was supposed to be 11.5 kilometers. I felt surprisgly good warming up and ran well. Splits were 5K in 19 min (not too crazy), 8K in 30:35, and 10K in 38:12. Finished up in 44:25. More good news is there was no soreness or fatigue on Sunday, a good sign that I am gettting stronger. Just not faster. Our team placed 10th out of 55, so we accomplished out goal. My 6:10 per mile average got me 11th on the first leg. Thurs: 3 easy with Sumo pm: 1 mile warm-up, then 5:48 mile on artificial turf. Summary: Not much intensity this week. Recovery after the long run on Sunday was surprisingly good. The mystery of quick times on the artifical turf continues. This summer I ran a sub 18 running barefoot back and forth around goal posts. On Thursday I decided to run a tempo one mile on the turf with lightweight shoes . No way do I run 5:48 on a flat road in training, yet how can I do it on grass with multiple 180 degree turns following a 10 mile day? I have no idea. I felt pretty strong in the 5K- we ran this race on the flightline, so a good half of the distance was a straight shot with a nice tail wind. For as hard as I train, I am disappointed with 18:20, but going to the age graded caclulator, that converts to 15:08, comparable to what I ran in college. I've got 2 more races the next 2 weekends. Can't wait! Alberto Salazar, coach of the Nike Oregon Project, has raised a few eyebrows lately with his much publicized tweeking of Dathan Ritzenhein's running form. Now, even National Public Radio is getting into the act- airing this facinating discussion on the subject featuring viewpoints from Jennifer Kahn (who wrote New Yorker piece The Perfect Stride), Scott Douglas, and Bill Rodgers. Hey, the more national exposure for runners, the better. Maybe one day when an American track and field athlete or distance runner sets a record or wins a major race they will make ESPNs Sports Center! Training in Heat May Improve Performance- In ALL TEMERATURES! If you are as old as I am, the name Benji Durden may ring a bell. Durden put up an impressive string of 25 sub 2 hr 20 marathons, including a sub 2:10. He even made the Olympic Marathon team by finishing 2nd in the U.S. trials- unfortunately he never got to run because that was in 1980- year of the boycott. I clearly recall one aspect of Durden's training that stood out more than the rest- "Always looking for a better approach, Durden began running in several layers of sweatsuits even in the Georgia heat" Now, after all these years, science has finally valided his theory that heat training made you a better runner in all temperatures. Back to the study. According to Peak Performance at runnersworld.com, subjects exposed to heat acclimatization exercised for 90 minutes per day at 50% VO2 in 100 degrees F- a slow run in very hot conditions for 10 days. How ironic that I stumbled on this information now- less than 4 weeks away from a sure to be warm weather half marathon in Cambodia. It's cold here now, so I've been doing a few short workouts long enough to make me sweat(indoor treadmill and cycling). I've even been in the sauna twice in the last few days. After reading this, I'll continue some, but not all, of my workouts indoors- and I'll add an extra layer or two to make sure I work up a good sweat. When you think intervals, the first thing that comes to mind is 100% effort and total exhausion. That shouldn't always be the case, especially when you are not rested or haven't done any recent hard interval sessions. On Wed this week instead of my usual sizzling 800s, I did 4 x 1 mile in 6:24, 6:19, 6:20, and 6:12 with 2 min recovery. A very good workout that came close to simulating 10K pace, but not all out ( recall that I recently turned in 2 x 2 miles under 6:10/mile pace). That's also a good sign when the last one is the quickest. I had something left. I'll do a hard interval workout again soon, but not without a real easy day beforehand. Bairu, in case you never heard of him, is a very good runner. As a Wisconsin Badger, Simon won 2 NCAA cross country national titles- no easy task, so we know he has ability. But for him, it's back to the marathon drawing board. Are you kidding? How can a world class runner BE SO DUMB! Marthoning 101 calls for carbohydrate intake during the race. This is either a major coaching blunder or just plain ignorance. I don't know if Simon was taking in a carbohydrate drink, but there are no excuses. This kind of crash should not happen to a runner with world class ability. My rule? 200 calories per hour- 2 gels or one every 30 minutes. Even Lance Armstrong knows better. Sun: jog 3 miles with Sumo, bike to the pool, 1,000 meters total, bike home. Easy day follow hard run on Sat. Mon: Due to lightening, Sumo kept me up half the night so I sort of slept in. Still got in a total of 6 easy, then 3 more with the dog when I got home late. Tues: 2 mile jog with Sumo at 5 am, then after an early morning class I went back to the treadmill for 3 miles- including 4 x 3 min at 9 mph. After work did some short sprint work with the kids running program- another 2 miles total. Wed: 3 miles with Sumo, then 4 x 1 mile in 6:24, 6:19, 6:20, and 6:12 with 2 min recovery. 1 mile cool down. Total for the week= 54 miles. This was a good week with the extra long run on Thurs and actually 3 interval workouts. Roker's time computes to 16:24 per mile. Edison Pena- 5 hr 40:51! Definitely the feel good story of the year! Out of the 37,000 duffers that will pollute the streets of our fair city this Sunday - November 7th - maybe 500 are athletes. The elite runners are something to watch. They are so lean they look almost alien. Them I admire. They are in an actual race. It is the 36,500 other fools that annoy me every year. -C.J. Sullivan quoted in a Huffington Post article by Dave Hollendar Are New York Marathoners Athletes? Turns out Sullivan was just getting warmed up. He goes on to say this: "Marathons are the last refuge for those that couldn't cut it in other sports. Any knucklehead in decent shape can train and then run 26 miles in under 4 or 5 hours. It means you are in shape. It does not make you an athlete." " And then you hear that if you finish - no matter what - you are a winner. Well that is just plain wrong. 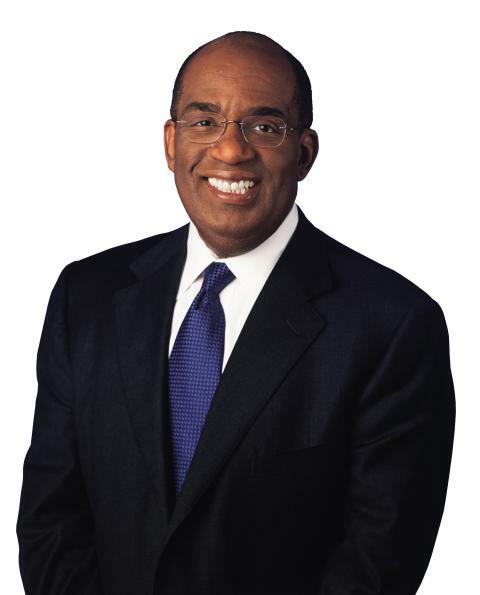 You lost by hours, sluggard. No one cares that you finished two hours behind the lead pack. You are not a winner. Just a real slow runner." For the record, in 2009 at New York Joshua Hunsberger took 500th place in 2:53:05. The rest, according to Sullivan's definition, are not athletes. As those of you who work full time are aware, sometimes you have to adjust your training in order to fit everything in. After a 6:30 am class on Tuesday, I have a window of opportunity to get in a short workout before starting the rest of the day. Last week I got in a swim, and before that I did 5 mile loop around base. Tuesday I did something new. Realizing that I train excusively on flat roads, I decided to hit the treadmill for some uphill running. The primary risk to any runner attempting hill repeats is calf/achilless strain, so for this reason I kept the speed at a constant 6 mph (only 10 min per mile!). After a five minute warm-up, I did 8 x 2 minutes at 8% elevation, then finished up with a quick cool-down. 3 miles total in 30 min. I definitely enjoyed this short but somewhat challenging workout, and look forward to building on it. The treadmill even gave me total feet climbed- I think it was 785. Just another measuring stick! Wednesday I felt it was time to ease back into flat intervals, so after a couple of miles with the dog went back out for some 800 meter repeats. Since it's been 2 weeks since my last interval session, the goal today was not to run blazing times, but get in a good quality workout with short rest. The first 800 was a slow 3:14, however after the first 4 or so I was running them in 3:07-3:08 consistently. This turned into a very good workout for me- in full sweats (it's getting cold here! ), I did 10 x 800 meters averaging 3:09, with just 60 seconds recovery. This was a much better workout than I could have done with a continuous tempo run. I am done with the hard stuff until Sat, when I hope to attempt another 17-19 miles. I'm feeling good about my progress and praying that I don't get sick anytime soon. Coach Alberto Salazar has been tinkering with Ritz's running form. It all makes sense, but let's see how he does in New York next week! Now if I can only find results from the Whitewater Marathon in 1972 or 73(I recall 2hr 51 min but not which year), I could move up. Thurs: 3 miles with Sumo, then 7 miles. PM: 2 miles with the kids. Felt good. Fri: 2 miles easy with Sumo. Sat: 2 miles with Sumo, then 17 miles in 2 hr 18 min. The last 3 weekends I've run a half marathon, 10 mile tempo, and 10 mile race. To break out of that rut today I got in a total of 19 miles. Can't wait to see how I feel tomorrow! Even though I only averaged 8:10 per mile on the GPS, I feel this was a good workout. My first 2 miles were around 9 min pace, the next 1-2 were around 8 min pace, followed by several miles in the 7:30 range. My last mile was 10 min. I don't advise any kind of tempo or interval workouts the week following a long race like that. Normally I just take it as I feel with an objective to keep my weekly total miles from dropping, especially if I have more races on the calendar. The extra miles today put me over 60. If I can keep this going and add an interval workout, watch out! MY COMMENT: Dr. Cucuzzella is tough! I wonder if he is a candidate for the 5 sub 3 in 5 decades club? Perhaps not yet. MY COMMENT: I love his attitude! He's not going to run a 2:05 at NY, but he's up for the challenge of running against the best and sounds ready for another PR (personal record). Last night I did race on Camp Humphreys that started at 9 pm- coinciding with the Army 10 Mile start in Washington D.C. I managed to hang on and finished up averaging 6:20 per mile (67 min for 10.6 miles), matching the exact pace I averaged in the half. This was a very low key event and for me nothing more than a good hard workout. A few days ago I thought that I was lacking speed, but I am also very aware that I have not run farther than 14 miles. In other words, I have lots of work to do! What else did I learn? I have to find a better combination of inserts and long distance racing shoes. I am no longer comfortable with these discontinued Brooks Burn and broken down PolySorb inserts (I have some new ones on order!). My cardiovasular fitness is great, however my legs were definitely fatigued on that second lap around Camp Humphreys- something that can be improved with a weekly longer run. I also am going to spend a few minutes a week in the gym for some leg press work. One more point: The day after my half marathon two weeks ago, my legs were very sore. Today, the soreness is minimal, a sign that I am indeed getting stronger. Ryan Hall is Looking for a New Coach! Will Hall follow the path of Dathan Ritzenhein and Alan Webb to Oregon and the land of Nike? Hall is paid a substantial sum of cash to run in Asics, so to make it happen Nike would have to step up and buy out that contract. For as good as he is, I've never seen a top American distance runner get criticized as much as Ryan Hall (myself included) for his infrequent racing. He's a great, relatively young talent, so hopefully we'll see a rejuvinated career in a new environment. Run For the Money- Chicago was Amazing! Watch the exciting finish of the Chicago Marathon between Olympic Champ Sammy Wanjiru and London winner Tsegaye Kebede as they fight to win the $500K prize for winning the World Marathon Majors along with another 75K for winning the race. Think money was not a motivating factor- just watch! "Truly emptied, Kebede would cross the line in 2:06:43, 19 seconds behind Wanjiru's 2:06:24. Wanjiru collapsed to the ground, propped up and fed water by waiting race volunteers, showing an unusual amount of fatigue after what can only be described as a once-in-a-career effort. The Kebede/Wanjiru duel has to be considered one of the greatest and most dramatic late-race marathon battles when one considers the caliber of the two runners and the career and earnings-defining nature of the race. Wanjiru faced the toughest the world had to offer (namely, Kebede) and overcame deficit, doubt and fatigue to claw his way to an amazing victory. What a classic race." My legs were surprisingly sore the day after my half marathon, a sure sign that I ran beyond (distance and pace) my preparation. The best explanation on muscle soreness I've located can be found at Time-to-Run. As the article states, the muscle and connective tissue are damaged, and you should not attempt to run again until that soreness subsides. That doesn't mean you should sit on the sidelines until the pain is gone. To the contrary, I recommend daily non-running related physical activity such as swimming or cycling to maintain cardiovascular fitness. Although you won't elevate heart rate, I think even walking is a lot better option than doing nothing (not in terms of speeding recovery but to prevent deconditioning). Do anti-inflammatories help? According to one study using eccentric weight lifting to induce soreness, the level of pain and even Creatine Kinase (the marker for tissue damage) is reduced, however the ability of the muscle to perform did not recover any faster sportsinjurybulletin.com (the fact that ibuprofen appears to reduce CK levels quicker makes me think ibuprofen is not a bad option). You can try some gentle work using The Stick, or Foam Roller, but the best advice may be to reduce the level of damage you suffer in the first place through training. Stuff like eccentric leg presses or downhill runnning may help some, but the bottom line is you probably need to do hard, long runs. In other words, races. Think about those Marathon Manics who able to run back to back marathons every weekend and even two on a weekend. There is definitely something different about those folks. It's not that they are able to recover faster, but I believe they've been able to train themselves to the point that they experience minimal tissue damage. Running a marathon every week will eventually do that, at least compared to runners who race a marathon twice a year. But outside of that amazing group of folks, who is willing and able to do it? Great Website For Coaches of Young Runners! 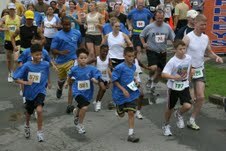 Check out this New York Road Runners instructional website for coaches of young runners. Congrats to NYYR- this is outstanding, and not only for kids! Distance Running Tip- The Taper! Less than 2 weeks ago I raced a distance slightly less than 10K and felt great! I'd like to reproduce that feeling this weekend in a half marathon, so will try to duplicate that taper. Prior to that race, I did a long run the weekend before with a quality interval session on Wed. This week, I did 14 miles on Sunday and today (Wed) I did a 2 mile hard effort. I felt very strong- under 12 min despite the misfortune of missing a turn thus having to do an abrupt 180 to get back on course. I could definitely tell that my leg speed and not breathing was the limiting factor. Maybe it's time for 400s? I felt leg fatigue the rest of the day so didn't do anything else. I'll run an easy hour tomorrow and do the 2 x 800s on Friday, then hope for the best. On Sunday I plan to go out at 6:15 per mile and see how long I can hold it. Pray for good weather! 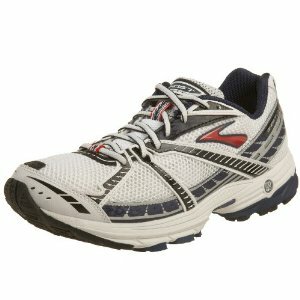 Check out this less expensive option for minimalist running. Besides the obvious (blood test to check for anemia other abnormalities) what should Hall do? I found this interesting article Overtraining Effects On Performance: If you want to prevent staleness and overtraining, keep a record of your quality of sleep and levels of fatigue! that identifies poor sleep as a leading indicator. From a personal perspective, I was running well a couple of years ago with a 2:55 at the 2008 Seattle Marathon and again in March 2009 at Napa Valley (see splits here). At the time I was only doing 17 mile long runs, and felt that I might improve if I got that up to 19 or 20. The problem was the longer run led to a longer recovery, and I ended up in a state similar to what Hall is describing. Looking back, I also underestimated the importance of sleep (I had my share of bad nights living upstairs in an adult family home). Unless Hall is absolutely zapped, my recipe for recovery would be to come down from altitude for a month and just run comfortably as he feels and add some cross training until he snaps out of it. I'm not a believer in extended lay-offs because to do so requires a build-up, and those are never fun. Just my opinion, but I think that's the hard way to do it. Here is more good insight on overtraining from Owen Anderson (I wondered whatever happend to him!) at educatedrunner.com.